The evidence is mounting: being sedentary, even for people who exercise regularly, is detrimental to health. One day I was doing a little internet research about treadmill desks and came across the FitDesk. It is a stationary bicycle with a desk attached. I was intrigued. I did a little more research, read some reviews, and decided to buy it. That was nearly six months ago, and I’m here to report that it was one of the better purchases I’ve made in a while. 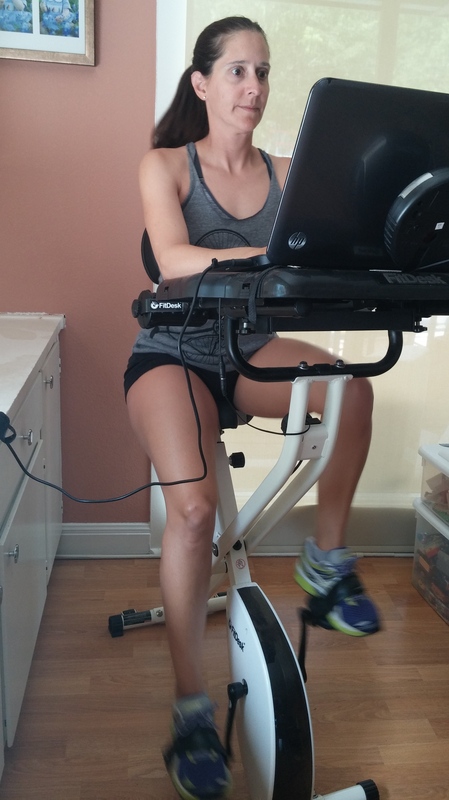 I ride using my FitDesk almost every day. I use the time I’m riding to answer emails, plan client workouts, surf Facebook, and buy way too many things off of Amazon. (Like the FitDesk itself, which I picked up when it was a Deal of the Day. Woo Hoo!) Basically, if I’m going to be sitting at my laptop, I’m going to be using the FitDesk. Even this post was written while pedaling. One of the things I love most about the FitDesk– and there are many great qualities to choose from– is that it’s so so so quiet. I can ride it without driving myself crazy by the noise, and my kids can watch TV in the same room while I’m riding without turning up the volume. The other nice feature of the FitDesk is that it’s easy to adjust, so 5’3″ me and my 5’9″ work-from-home hubby can both use the same FitDesk. I’d resisted buying a piece of exercise equipment because I didn’t want something noisy or something that takes up a lot of space– so the Fit Desk has been a perfect fit in those regards. Now, I’m not out to convince myself that riding and working is the same as going for a run. And that’s okay. I bought the FitDesk to insert more movement into my day, and it certainly achieves that goal. I can ride very comfortably (16-18mph, resistance set at 4 of 8) without breaking a sweat, and the seat is comfortable enough to ride for an hour. That sneaky workout burns about 500 calories– not bad! The FitDesk can be used more like a traditional stationary bicycle, with higher resistance and just holding the handlebars rather than typing, and using it that way does provide a high quality cardio workout. If you work from home and have thought about a treadmill desk, give the FitDesk a look. It would also work great for someone who finds it hard to fit exercise into the day but likes to watch TV at night. It’s a small footprint and quite affordable for quality exercise equipment. And the benefits of more movement are priceless! I have not been compensated to write this post. All opinions are my own. This entry was posted in fitness, healthy living and tagged active lifestyle, busy life, cycling, entreprenuer. Bookmark the permalink.